Me…judge? Had you asked me, I would have said that while I’m not always successful, I try not to judge, because I know that I can’t know all the details of any particular situation. But recently I’ve become aware that there has been a type of judging I did as my children were growing up…a measuring of my child against someone else’s child and their behavior. Sometimes my child came up “better”; other times I envied the other parent. It felt like my children were a reflection on me and my ability to parent. I know–that’s not necessarily so, but that’s how I had felt as a child, and it carried over to me as a parent. Recently, though, I’m realizing that you can be the best parent in the world, and that’s no guarantee that your child will behave as you would have hoped and expected. Sure, there may be some things I’d have done differently–even for my own child–but that doesn’t mean that another parent is wrong…not unless there is abuse involved. Children are not clones of us. They are independent creatures…and they have the ability to make their own decisions. In an ideal world, those decisions would always be positive ones. But we don’t live in an ideal world–and so sometimes our children make choices that can create problems…for them and their families. What’s needed then is not judging…it’s nonjudgmental support. It’s recognition that we all do the best we can…but sometimes that best just isn’t enough. Our children have to learn to make their own decisions. Sometimes they learn from others’ experiences…but sometimes they seem to have to learn the hard way. None of us is perfect…and so none of us can judge righteously. None of us has ever seen a motive. Therefore, we don’t know we can’t do anything more than suspect what inspires the action of another. For this good and valid reason, we’re told not to judge. Let’s spend less time judging and more time supporting. How can I know that someone is a follower of the one we call Christ? Sounds pretty simple and straightforward, doesn’t it? But what am I to think when I hear people who say they follow Christ say that people who are LGBT should be executed by a bullet in the head? or when they try to pass laws that say it’s okay for hospitals and doctors to turn away people from treatment because they are LGBT? or schools refuse to teach students for the same reason? What about children who have to fight to be accepted as who they are…because inward and outward genders don’t match? Why do so many families throw children out when they don’t meet family expectations? Martin Luther King wasn’t a perfect human being; none of us are. But I think he understood–and challenged us to live–the commandment of the one that so many of us say we follow. What we’ve been doing isn’t working. Maybe…just maybe…we might find a new way of living if we tried this. Recently I attended a meeting of an organization I belong to as a church musician. I enjoy going to these meetings…enjoy hearing new music and getting ideas for music I want to purchase to add to my library. However, I also sometimes find myself cringing. I am a classically trained organist. I love classical music…I find it very soothing. I love the music of “high church” and have played a lot of it. I’ve been playing for church in some form or another for almost 60 years, much of the time in “traditional” services. Now, though, I find myself involved in a contemporary congregation. I am still involved in church music–but instead of playing organ, I often play piano…and am responsible for also scheduling some of the bands who rotate as part of our music ministry. When I play, I still often use many more traditional hymns…ones that have been around for a long time and that I grew up with as well as some of the wonderful new hymns that have been written. However, I do not limit myself to them, but I look at much of the current praise music as well. Yes, there are some things out there that are not particularly inspiring–but that’s also been true of hymnody. What we forget is that traditional hymnody has the advantage of at least a couple hundred years to cull out the things that are lesser; contemporary music is just beginning the time of doing that. It is possible to find music that is appropriate for worship in both traditional hymnody and in what is commonly called praise music…but too often those two categories are seen as exclusive of each other–and often at war. At this meeting I was at, there was identification of a job available. Part of the responsibilities included working with the praise team…and when that was stated, you could hear an audible groan. Several friends shook their heads and made faces of distaste. If we see ourselves as music ministers, then isn’t it important for us to be sensitive to the folks we minister to? Isn’t it possible for us to recognize that different people respond to different kinds of music? Is it really so bad for some of our music to be simple repetitions of scripture verses…for that to be a way to memorize something that can sustain an individual in times of difficulty? Can’t we find a way to honor and use the wonderful hymns that have stood the test of time…but to also look for the same kind of excellence in contemporary praise music? Isn’t there room for all of us at the keyboard? I think so. There was an article in our local paper this morning that saddens me. I understand that our immigration policy is broken…that we need desperately to make some changes to fix it. But I would like to see us try to find ways of doing that with as little damage as possible to our society, our schools, and all the individuals involved. I’m not sure the bill that our legislature is considering does that. According to the article, children whose parents brought them to this country illegally would be denied the option of federal financial aid, state aid, or in-state tuition. For many that would make it even more difficult than it already is to gain further education–since the legislature has already blocked funding to any public college or university that gives these children in-state tuition. I understand that these parents brought the law…but I also am aware that sometimes that situation is not as black-and-white as we would like it to be. There are many factors that go into causing individuals to leave their own countries in order to try to find a better life for themselves and their children–and without having walked in their shoes, I’m not at all certain that I can make a righteous judgment. Beyond that, these children had no choice. They were brought here–many of them–before they were aware at all that they were born in a different country. They have called this country home for their entire lives…have dreamed about the ways they can contribute…about possibilities that might be open to them. Often the first knowledge they have of their illegal status comes when they are beginning to make real plans for their future…and suddenly life is turned upside down. Do we really want to do this? Do we really want to visit the sins of the parents on the heads of the children? Do we really want to force them out of the country they have considered their home for their entire lives…and give them no assurance that they would be able to return? Many of these children have gifts and talents they want to sure with their country…and that we need. Can’t we work together to find ways that would be beneficial to us all? I had wanted to watch the George C. Scott A Christmas Carol over Christmas–but because we had just moved and stuff was still somewhat disorganized, I couldn’t figure out how to get our DVD player to work. My husband (who normally gets that stuff done) was out of town being Santa…so I decided it just wasn’t going to happen this holiday season. The disc has been sitting in the player ever since…I never got it put away. We have a friend staying with us this week–and we decided to watch something before turning in last night. After going through a number of possibilities, we all agreed on that movie. I’d forgotten just how modern the thoughts expressed in it are–even though it was written in the early 1800s. Mankind was my business; charity, mercy, forbearance, and benevolence, were, all, my business. The deals of my trade were but a drop of water in the comprehensive ocean of my business! I’m not sure we understand it today either. What a cold way to see the world. And yet–given much of the political rhetoric today–I think that’s how many see the world. He discovered that there was so much more to life than he had experienced. Yes, money was helpful…but for helping people, not for clutching tightly to his chest. People were important. It wasn’t an easy change, but if he could do it, so can we. We have to! Our world is small enough and interconnected enough now that we have to figure out ways to make humankind our business–our top priority. There are many things from which I might have derived good, by which I have not profited, I dare say,’ returned the nephew. ‘Christmas among the rest. But I am sure I have always thought of Christmas time, when it has come round -apart from the veneration due to its sacred name and origin, if anything belonging to it can be apart from that- as a good time; a kind, forgiving, charitable, pleasant time; the only time I know of, in the long calendar of the year, when men and women seem by one consent to open their shut-up hearts freely, and to think of people below them as if they really were fellow-passengers to the grave, and not another race of creatures bound on other journeys. And therefore, uncle, though it has never put a scrap of gold or silver in my pocket, I believe that it has done me good, and will do me good; and I say, God bless it! Can we live every day in that spirit? Not for myself, but for some of my family and friends whom I love dearly. And not even just for them–but for my country and our world. I understand that we aren’t all ever going to think alike, and I’m okay with that. In fact, I’m more than okay. I like the diversity of thought, opinion, and experience to be found in any group of people. I may not agree with everything that is said, but as I struggle with comprehending where some of those thoughts and opinions come from, my own perspective gains. In hearing someone else’s experiences, I get a broader sense of life. I also understand that we read scriptures differently–both in having different canons of scripture (for those who are religious/spiritual) and in reading the same scriptures differently. And again, I’m okay with that. Any time the finite (us) have an experience with the Infinite (the Divine, God, Allah…whatever name you may choose to use), trying to share that experience in words is going to be difficult–and incomplete. But what scares me is not how pervasive those differences have become–but the way in which those differences have started being perceived. When did it become acceptable to start separating people into classes of acceptable and not acceptable, based on where they came from…the color of their skin…who they love…? to demonize anyone who is “other”? What has happened to us to make it seem even marginally acceptable for a state legislator to propose an initiative to execute homosexuals by a bullet in the head (or any other “convenient” method, according to the bill)? Hopefully it will never pass…but to even think that this kind of treatment is acceptable is sad and appalling. Why is it acceptable to take children who have known no other life but in this country and force them to “return” to a “homeland” that is not theirs…through no fault of their own? Yes, we need to find ways to fix our immigration situation, but not on the backs of children who were brought here before they knew anything else…and who only want to offer their gifts and talents to what they have always believed is their home country. Why does it seem impossible for those of us who are white to give validity to the experiences of people of color when they talk about being oppressed? Why is there such a disproportionate percentage of African-Americans locked up…many for offenses that whites are given probation for? Then, when they are released and trying to find decent jobs, that criminal record is held against them forever. Yes, I know that there are many who are locked up for valid reasons…but our legal system seems disproportionately biased against those who are not white. Why do we turn our backs on the mentally ill? Yes, it was a good idea to try to mainstream them back into the community…but we didn’t provide funds to help provide the counseling needed for this to succeed, and so now many find themselves homeless–or in jail. Why can we not agree on sensible laws about gun ownership? I know of no one who is “trying to take away everyone’s guns”…but that is the first mantra chanted whenever someone proposes any changes. How many more Columbine High Schools…Sandy Hook Elementary Schools…Gabby Giffords…Jewish Community Center…? How many other accidental shootings when children find a loaded gun and decide to play with it? When will we decide enough is enough? When can we live out this prayer for the world, shared by Rabbi Harold Kushner in 2003? I cannot imagine Star Trek without Mr. Spock. He was the character I often identified with…someone who had two halves that did not always blend seamlessly. The Vulcan side of him–the stoic, somewhat distant part–was predominant, but occasionally the human, emotional side would break through…and he didn’t seem to quite know what to do about that. As a Vulcan, he had a unique greeting. I practiced off and on in order to get the hand position correct. Sometimes I succeeded; more often than not, my fingers wouldn’t quite cooperate. And I loved his verbal greeting–“Live long and prosper.” It seemed such a wonderful invitation. The Vulcan greeting is based upon a blessing gesture used by the kohanim (koe-hah-NEEM) during the worship service. The kohanim are the genealogical descendants of the Jewish priests who served in the Jerusalem Temple. Modern Jews no longer have priests leading services as in ancient times, nor do we have animal sacrifices anymore. (Yes, people really do ask about that!) The sacrificial system ended with the destruction of the Temple by the Romans in the year 70 C.E. However, a remnant of the Temple service lives on in the “kohane blessing” ritual (duchenen in Yiddish) that is performed on certain holy days. The actual blessing is done with both arms held horizontally in front, at shoulder level, with hands touching, to form the Hebrew letter “shin.” This stands for the Hebrew word for “Shaddai,” meaning “Almighty [God].” Nimoy modified this gesture into one hand held upright, making it more like a salute. 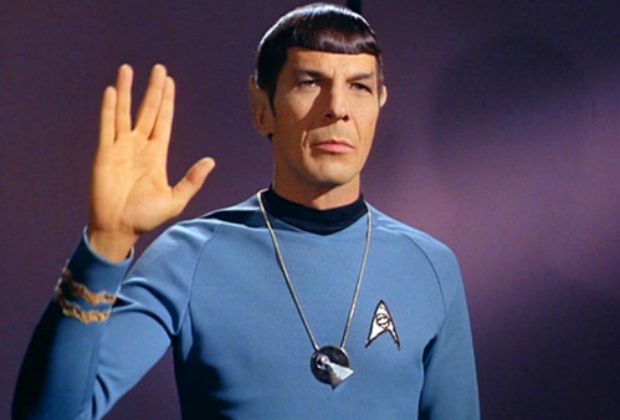 So, technically, the Vulcan greeting is not the same thing as the ceremonial Jewish blessing. Still, the resemblance is close enough to evoke instant recognition among knowledgeable Jews. As a child Nimoy was curious about the experience of this blessing, and when he uncovered his face to watch, he was deeply moved by the great sense of spirit and theatricality…and it stayed with him. In addition to the salute itself, the ceremonial use of “Live long and prosper” and its lesser-known reply, “Peace and long life,” also show a strong Jewish influence. The format is similar to a traditional greeting in Hebrew: “Shalom Aleichem” (peace be upon you) and the answer, “Aleichem shalom” (upon you be peace.) Muslims have a similar greeting in Arabic. Jews, Muslims, Vulcans, Christians…all with an awareness of something greater than ourselves…all with a desire for peace. Thank you, Leonard Nimoy, for reminding us of the best within us. We will miss you.